• The school ethos promotes active listening within the management team. • There is a coaching policy which replace classroom observations, feedback and the associated paperwork. • The school improvement plan clearly shows coaching as a school improvement tool. • The budget shows that time and money has been spent on introducing coaching in the school. • All teaching staff know and understand what coaching is and is not. • All senior leadership staff trained as coaches. 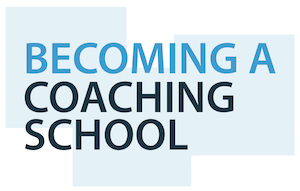 • All new staff have an induction to what coaching is and are involved in the coaching process. • Timetable is in place for SLT to coach teaching staff. • There is improvement in the quality of teaching from baseline measures. • All SLT’s monitoring through observation is carried out using coaching methodologies. • Some other monitoring is carried out using a coaching methodology. • Governors know and understand coaching as a methodology for their school improvement. • The school ethos promotes active listening within the teaching and support staff. • The coaching policy should also include other areas of monitoring and evaluation. • The school improvement plan clearly shows coaching as a key school improvement tool. • The budget shows that time and money has been spent on developing coaching in the school. • All staff including support staff know and understand what coaching is and is not. • All senior and middle leadership staff trained as coaches. • All new staff have access to quality training during their first year. • Timetable of coaching in place which involves all trained staff as coaches and all teaching staff as coachees. • Coaching opportunities are offered to all classroom based staff termly. • There is improvement in the quality of teaching for all teachers and support staff from baseline measures. • SLT, subject and key stage leader’s monitoring of books, planning and observations are carried out using coaching methodologies. • Governors are beginning to use coaching as a methodology for school improvement and monitoring. • The school ethos promotes active listening at all levels. • The coaching policy should include all areas of monitoring and evaluation. • The school improvement plan clearly shows the coaching as the main school improvement tool. • The budget shows that time and money has been spent on continuing coaching in the school for the long term. 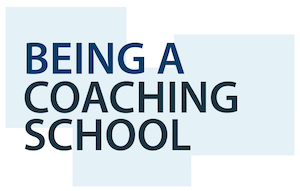 • All teaching, classroom support, administration and premises staff know and understand what coaching is and is not. • All teaching staff trained as coaches. • All new staff have access to quality training on arrival. 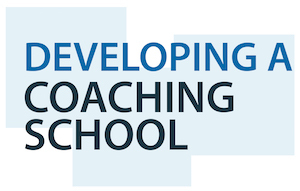 • Timetable of coaching involves all teaching staff as both coach and coachee more than once a term. • Learning walks, observations, looking at planning, pupil interviews, helping interviews and looking at outcomes through books and pupil progress meetings are carried out through coaching. • All support staff have opportunities to coach and be coached by their peers. • Staff seek opportunities themselves for coaching from colleagues. • For non-classroom based staff coaching is used for their performance management. • There is continuous improvement in the quality of teaching for all classroom staff. • Governors meetings reflect the coaching methodology and support the head through coaching.